Learn about changemaking people and organizations in RVA, and be inspired to make a difference with your deeds. 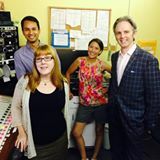 Tune in to WRIR 97.3FM Tuesdays at noon. Inspire Indeed airs on WRIR 97.3 FM Tuesdays at noon. This interview talk show explores RVA’s nonprofit sector and highlights individuals and organizations that are making a difference in our community. Listeners get a chance to hear about community issues that are sometimes hidden or misunderstood, and discover ways to get involved.